Meetings are made more productive by interactive displays that you can write on and share with remote participants. We review five devices from Google, Microsoft, Cisco, Samsung and InFocus. Whether your business team is designing a next-gen widget or developing an online campaign, you need a place to get together, brainstorm and map out a strategy. In years past, a dry-erase whiteboard was typically where such ideas were recorded, with some obvious drawbacks. For starters, somebody had to capture all those great ideas from the whiteboard before it got erased. Worse, remote meeting attendees couldn’t see the on-board action. Today, however, such collaboration can be done with a special large display that users can present from, write on and share with meeting participants halfway around the world. With a laptop or mobile device connected wirelessly or via video cable, the touch-sensitive display acts as a giant tablet where participants can interact with each other and an array of digital materials — and easily save the results to turn into action items. Instead of just going through a canned slideshow about how your product stacks up with a competitor, you can highlight your company’s recent sales dip while showing the two products’ web campaigns next to a checklist of differences. Go a step further and open CAD models of each product that can be rotated to show differences. All the while, you can use your fingers or the included styluses to write, draw, tap, swipe and drag items around. In a very real sense, a world of creativity and collaboration are at your fingertips. 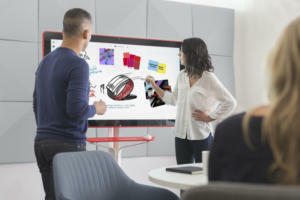 For this review, we looked at five top digital whiteboard displays suitable for conference rooms, huddle rooms or open areas in the office: the Cisco Webex Board (formerly Spark Board), the Google Jamboard, the InFocus Mondopad 6522, the Microsoft Surface Hub and the Samsung Flip. All of them support local and remote access, document sharing and on-screen drawing. All but the Flip can set up audio or videoconferences directly from the screen; the Flip requires an external computer to do this. A few notable differences: The Mondopad runs on Windows 10 Pro, the Surface Hub uses a special Windows 10 Team operating system, the Jamboard uses a customized version of Android, the Webex Board uses Cisco’s Webex Board OS, and the Flip is based on the company’s Tizen software. At this point, you won’t be able to add any apps to the Jamboard, Webex Board or Flip, and the Surface Hub is limited to installing software from the Microsoft Windows Store. The Mondopad, by contrast, lets you add any apps that run on Windows 10. After five weeks of using these displays every day, running conferences and connecting remote participants, I’m convinced that this is the way to bring people and ideas together. Be warned: Priced between $2,700 and nearly $10,000 (plus the cost of a stand), these displays can be budget-busters, particularly if you deploy dozens of them throughout an enterprise. That said, they can reduce travel costs and increase participants’ efficiency, which goes a long way toward making up for their steep price tags. Here’s how these essential 21st-century business tools compare.